Understanding water flow through a rock mass is a fundamental issue in many areas of rock engineering. A rock mass is a dual permeability system where the flow through discontinuities is predominant. It is thus of prime importance to fully understand their hydromechanical behaviour to foresee how stress fields in situ can influence the fluid transport through fractures. 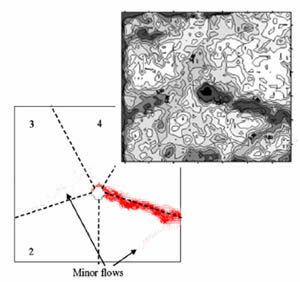 Flow within a rock joint is governed by the Navier-Stokes equations which are very difficult to solve. A simplified version is the Reynolds equation, which is considered to give better flow prediction. A flow model based on the micro roughness of the rock joint has been proposed which gives a better prediction of flow anisotropy. Measurement of inlet pressure and total flow rate. Measurement of the outlet flow rate (macro scale) in 5 sectors. 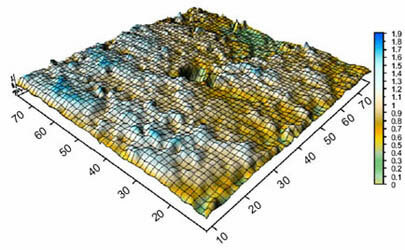 A FEM calculation is performed using ABAQUS to compute the flow. The innovation here is the reduced coefficient of permeability given to each element, which incorporates a micro roughness effect. 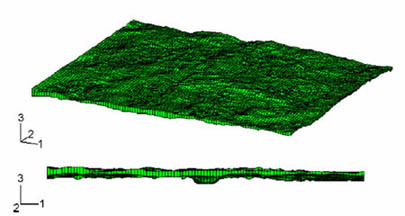 Figure 2: 3D FEM representation of the void space embedded within both rock walls. 8715 elements. Fig. 3 shows the distribution of water flowing out of a rock joint. 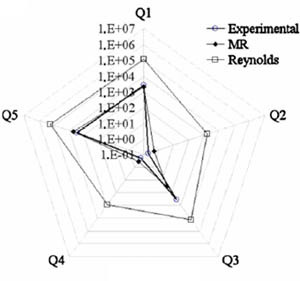 The model developed (MR) fits the experimental results very well whereas the Reynolds equation gives an almost isotropic flow rate. Fig. 4 shows a good agreement between the measurement of void space obtained by the laser and the water distribution within the joint.